More than eighty years after the Scopes trial, creationism is alive and well. Through local school boards, sympathetic politicians, and well-funded organizations, a strong movement has developed to encourage the teaching of the latest incarnation of creationism intelligent design as a scientifically credible theory alongside evolution in science classes. Although intelligent design suffered a serious defeat in the recent Kitzmiller v. Dover trial, its proponents are bound to continue their assault on evolution education. Now, in Not in Our Classrooms, parents and teachers, as well as other concerned citizens, have a much-needed tool to use in the argument against teaching intelligent design as science. Where did the concept of intelligent design originate? How does it connect with, and conflict with, various religious beliefs? Should we teach the controversy itself in our science classrooms? In clear and lively essays, a team of experts answers these questions and many more, describing the history of the intelligent design movement and the lack of scientific support for its claims. Most importantly, the contributors authorities on the scientific, legal, educational, and theological problems of intelligent design-speak specifically to teachers and parents about the need to defend the integrity of science education by keeping intelligent design out of science curriculums. 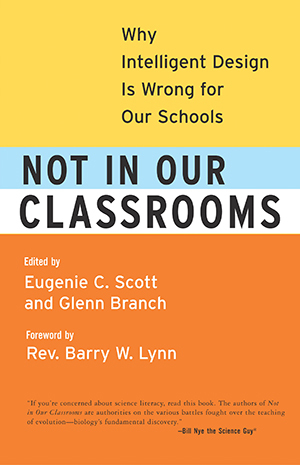 A concluding chapter offers concrete advice for those seeking to defend the teaching of evolution in their own communities.